The Invacare Pronto M41 Power Wheelchair is a full-featured model, ideal for those who are looking for increased efficiency, battery range, and top speed. 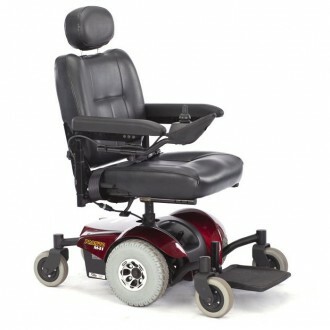 This chair also boasts a center-wheel drive platform, a version of Invacare's SureStep technology, and six wheels on the ground. The result: Superior stability and maneuverability. Even after packing the M41 with features, Invacare was still able to create a simple, clean, and easy-to-service chair that provides mobility & style for people on the go! If you’re in the market for a power chair, don’t hesitate, order today! Click the button below to add the Invacare Pronto M41 Power Wheelchair to your wish list.